Ireland and Portsmouth striker Ronan Curtis is reportedly attracting the attention of a top Championship club. FOYLE HARPS coach, Leroy McCourt took particular interest in the ‘Three’ FAI international awards this year as two of the local youth football club’s former players walked away with two of the top prizes. The Derry & District Youth F.A. club can claim to have played a huge role in the development of some of Ireland’s top senior footballers including the recently named FAI Senior Player of the Year’, Brighton and Ireland centre half, Shane Duffy, who retained the prestigious accolade at the RTE awards ceremony earlier this month - the first player to do so since Shay Given back in 2006! And Portsmouth striker, Ronan Curtis, who has emerged as one of the top players in English League One football since his move from Derry City last summer, winning the Checkatrade Trophy at Wembley on Sunday, was recognised for his outstanding performances for the Boys in Green during the past 12 months as he collected the Ireland U21 Player of the Year award. While the two players have taken different paths to the top, both players began their careers with Foyle Harps in the Derry & District FA. league and it’s something the club are extremely proud of. “Both of them were brilliant with us,” said McCourt who has been involved as a coach with Foyle Harps for the past 22 years. “In fairness, I’m sure both would admit they weren’t even the best players in each age group but what they did have was an unbelievable determination, they stuck it out. They were very good trainers and great lads. They gave us no bother and were born winners. They would do anything to get a chance. “Shane’s younger brother Tony was up with us first and he was a very good midfielder. Shane came up and got his chance with the Victory Shield and Everton signed him through us. Everton to this day have been absolutely brilliant to us. They’ve been one of the best clubs we’ve ever dealt with. “Shane went on leaps and bounds. He played in the Europa League with them. He then went to Blackpool, Yeovil and ended up going to Brighton. Coincidentally I’m with the same club. I go over every other month and he’s been their best player for me. He’s typical Irish, wears his heart on his sleeve. McCourt also suggested Portsmouth’s Curtis could be the subject of a move to a top Championship club in the summer. “And Ronan is absolutely flying too,” he added. “He’s actually taken me by surprise as well. He has to be the best newcomer in League One and I know for a fact there are Championship teams looking at him and Scottish Premier League clubs. There’s a team high up in the play-off places of the Championship who rang me looking for my advice about him and I gave him a glowing tribute. McCourt is a full-time Irish scout for Brighton while he has contacts with Celtic Football Club and numerous other clubs in England and Scotland which has proved hugely beneficial for Harps in recent years as their conveyor belt of talent keeps producing the goods. Leroy’s brother Paddy is also a product of the club and he went on to star with various teams across-Channel including Celtic, Barnsley and Brighton, not to mention winning 18 caps for Northern Ireland. Dundalk’s Michael Duffy and Patrick McEleney have also gone through the books of Harps and earned moves to Celtic and Oldham respectively. “Foyle Harps are probably the most successful youth team in Derry for producing players,” claimed McCourt. “All the teams are fantastic and they are all friendly rivals. We all have our different ways. Maybe because we have so many links, we just seem to produce good players. 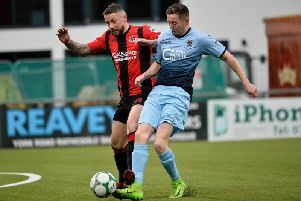 “You had Paddy (McCourt), Saul Deeney, Neil McCafferty, Shane (Duffy), Ronan (Curtis), Michael Duffy, Patrick McEleney and we have five or six young boys coming through with loads of interest in them but we have to try and protect them too. “The good thing about all our lads that went away is that they never forgot their roots. We keep them humble and we’re proud of them. Our main aim is developing players which is the same with every other club in the D&D and full credit to them all. They’re my friendly rivals but through the years I’ve had a lot of help from people like Raymond Carton, Big Ugg, Michael Hutton and obviously ‘Doc’ and Celtic coach, Matt Bradley who has mentored me for a few years. “There’s some fantastic players coming through the club at the minute too including young Corey McLaughlin who has been over with both Derby County and Wolves this year and both clubs are very keen while Oran McLaughlin has also attracted interest. So long may it continue,” he added.